HomeGold IRA BlogFeaturedWhat is the Relationship Between Gold and Oil Prices? What is the Relationship Between Gold and Oil Prices? We’ve explained to you before the relationship between gold and inflation, but have you ever wondered about the relationship between the gold price and the price of other commodities, such as oil? James Steel, Chief Commodities Analyst at HSBC Bank, spoke with CNBC during its “Commodities Corner” segment about how oil price movement affects gold. Gold and oil each have an inflationary relationship. Gold and oil have a relationship through commodity indices. In other words, when energy prices and the price of energy-related commodities go down, so do oil prices. When this happens, managers of oil companies end up selling “millions of ounces of gold” that they have kept as a protective hedge (much like how gold is used as a hedge against inflation). The relationship does break down at times and is not perfect. For example, oil prices haven’t moved much for 2-3 years whereas the gold price has been more volatile. Chinese buying has kept the gold market alive at this price. To learn more see our blog on Chinese gold demand. Consumer demand from China has stabilized the gold price and explains the reduction of volatility in the gold market. 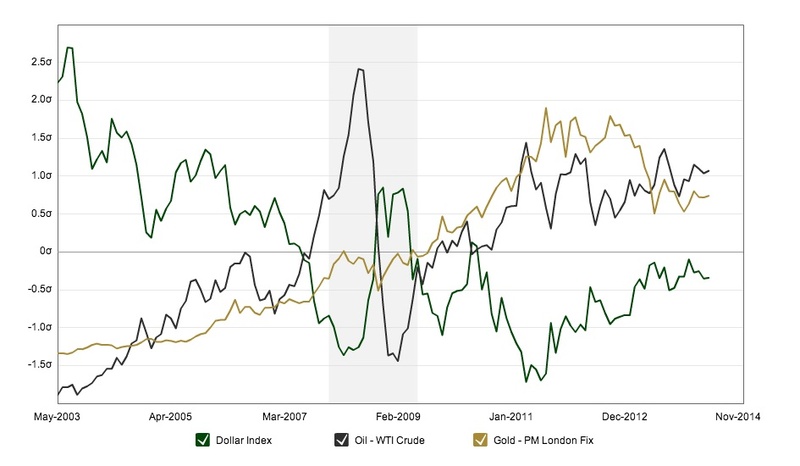 As can be seen in this interactive chart, the sharpest rises and falls in oil prices (black line) are usually accompanied by large changes in the gold price (gold line), and both oil and gold have an inverse relationship with the U.S. dollar (green line). If commodity fund managers use gold as a safe-haven for their $100 billion investment funds, don’t you think your portfolio should include gold as well? If you have a retirement account, consider protecting your assets with a Gold IRA. Call American Bullion at 1-800-326-9598 or request a Free Gold Guide today to learn more about your options for gold ownership inside of an individual retirement account.